In the summer of 1978, I received a call from the syndicate asking if I’d like to write for a strip called Heads and Tails which had been submitted by a commercial artist named Tom Armstrong. It consisted of celebrity caricatures along with some sort of humorous bon mot accompanying them. I told them that I preferred writing character driven work and suggested they use a talk show setting as the raison d’être for bringing in celebrities to interact with the cast. The syndicate called back and said “What have you got?”. Actually what I had was a character named John Darling and the cast of a small Ohio TV station. Along with talk show host John Darling, there was Phil the Forecaster, sportscaster Mike Majors, and news anchors Brenda Harpy and Charlie Lord. These characters all lived in the Funkyverse and had been growing and developing almost since the strip’s beginning. The syndicate and Tom A all liked the idea so John Darling and the cast of Channel One decamped from Funky and took up residence in their own strip John Darling. The above strip was from when JD still resided in Funky. With The Flash #114, Captain Cold makes his second appearance and this time with the full cover treatment. Other Flashionados must have appreciated CC as well and demanded his return and well they should because this is one frighteningly fridged felon (sorry, couldn’t help myself there). The story’s opening conceit is that Len Snart (CC) is about to get a parole hearing and Iris West and the Flash go there to testify against his release. Denied his parole, Lenny decides to get out of jail the old fashioned way by escaping. As a villain, Captain Cold provides the opportunity for some stunning visuals and the art team of Infantino and Anderson fire away with phasers on full stun. 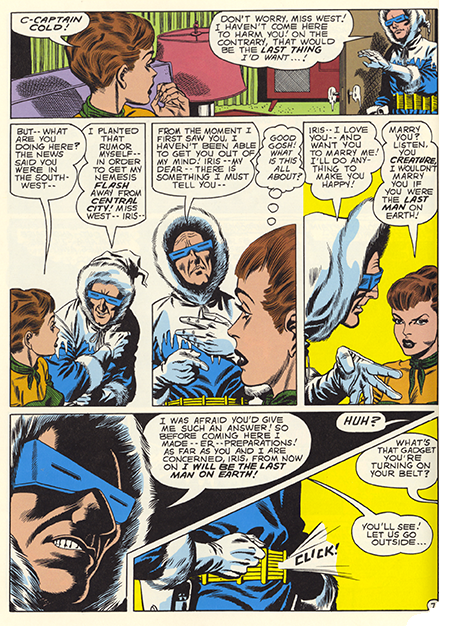 Captain Cold’s ice effects that flow from his glacial gun (sorry again) are used to full dramatic design effect by Infantino who also starts to experiment with some different panel designs partially dropping borders and squeezing things into unusual panel shapes. The design layout for page seven really begins to separate itself from the typical comic book pages of the day. John Broome does his characterization trick and reveals that the Chilly Captain (ditto) is a romantic at heart and that that heart has been stolen by none other than Iris West. 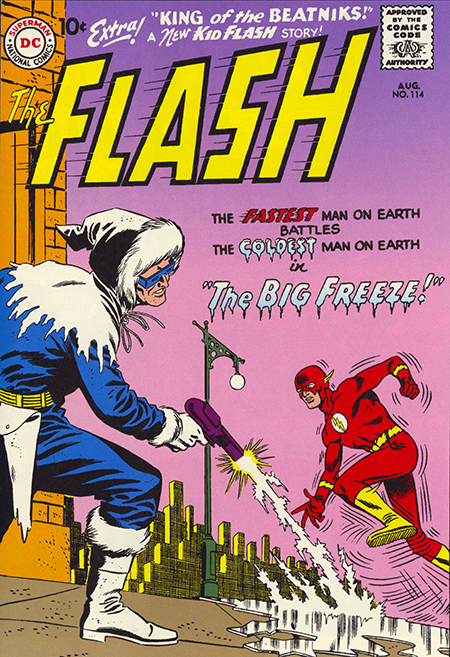 It adds a certain pathos to the Captain and makes it an A plot coupled with a second A plot as the plots intertwine to show the Flash saving a city held in icy hostage to Captain Cold’s feelings for Iris. All in all a very satisfying villainous romp. The second story is a Kid Flash tale entitled “King of the Beatniks!” and is the most egregious example yet of Broome trying to be a cool, shook-up, hepcat jivester from endsville. It’s best just to drive past this unfortunate scene without slowing to rubberneck.